When Hyatt’s footprint expands, I get excited! As a Hyatt Globalist who spends well over 100 nights a year at Hyatt properties and who reviews Hyatt hotel rooms all over the world, I want options. My options increased when Hyatt announced the initial expansion of its program in partnering with Small Luxury Hotels (SLH). We waited to know which of the 500 properties in the Small Luxury Hotel portfolio would come onboard next. We now have our answer as to which SLH properties are being added to Hyatt’s portfolio next. Adding another 56 small luxury boutique hotels brings the count to 110 new Hyatt options added in just a few months time. Thanks, Hyatt, for continuing to grow the Hyatt footprint. Where Are These Small Luxury Hotels Located? The newest locations of these Small Luxury Hotels are spread out around the world. I began by zeroing in on the properties that allow me through my loyalty to Hyatt to stay in destinations where Hyatt’s footprint was either small or non-existent. I found four I’d be excited to explore. Expansion of options is what every hotel loyalist wants! Where Do These Properties Fall On Hyatt’s Award Chart? Earn and redeem points is the name of the game, right? On the redeeming side, Hyatt did add a category 8 to its award chart making category 8 properties valued at 40,000 points. In looking at the 56 new additions, the points categories are spread out. This makes for even better options when deciding how to allocate my stays on points. What Benefits Will Hyatt Members Receive at SLH Properties? Hyatt members receive 5 points per dollar spent. It’s a nice touch on Hyatt’s part to include SLH benefits for all Hyatt members: breakfast, late checkout, and room upgrades. Hyatt members earn points, night stay credits, and can use World of Hyatt points. For the properties that will fall under Hyatt’s new room category 8, which means 40,000 points per night, be sure to check the cash prices. The prices and the category levels of these new additions might not make sense when you calculate the value using points versus paying cash for those nights. Remember that earning points and stay credit only applies to bookings through Hyatt. You can still book these properties at SLH.com or through the property websites, so it’s best to do the math before spending your 40,000 points! With the addition of these 56 new hotels (with Hyatt promising more to be added) and the 87 properties added by Hyatt’s acquisition of Two Roads Hospitality, that’s a bunch more properties I can look forward to! In creating the best criteria to use in sorting through all the properties, I picked properties in places I actually travel to and don’t currently have a Hyatt property choice I’m satisfied with. I really enjoy visiting Stockholm! I had a wonderful stay at the Slussen Hilton and highly recommend that property. However, the Bank Hotel would give me an opportunity to use Hyatt points, as well as stay on the opposite side of Gamla Stan and the water. The Bank Hotel is a renovated early 20th-century bank building. There are 115 rooms and 8 suites. Some of the suites come with a private terrace. I do like historic buildings that become hotels. I find both the architecture and history of these types of hotels fascinating. In general, Stockholm architecture is gorgeous. Both the building interiors and the rooms look very comfortable. The rooms seem spacious, which in Stockholm is not always the case. I did some checking on cash rates and award night availability. The rates run from the low $300 to the mid $400, depending on time of year. During the high season I found most nights I checked available on points. Especially at the high end of the cash price, at 20,000 points per night that’s 2 cents a point. I’m thinking I’d stop in to view what I imagine to be a beautiful historic building and get a sense of this property. If it felt like the location would be a fun one (I really loved the location of the Hilton Slussen) I would splurge on points for a boutique experience. The Nimb Hotel looks gorgeous! It’s a palace located in Tivoli Gardens. If you know Copenhagen, you’ll know that puts you right in the center of the city and all the tourist action. If you’ve never been to Copenhagen, a hotel located in Tivoli Gardens is a great location. This Small Luxury Hotel calls itself an intimate luxury hotel. From looking at the rooms and grounds, it surely seems like an appropriate description. The hotel design is Classic Danish with hardwood floors and classic room decorations and fixtures. There are only 38 rooms, 29 of which are suites. The hotel also boasts a rooftop terrace and an emerald pool. I did some checking on cash rates and award night availability. The rates run from the mid $600’s to the low $900’s, depending on time of year. During the high season I found most nights I checked available on points. Especially at the high end of the cash price, at 40,000 points per night that’s 2 cents a point. Copenhagen is an expensive destination. Hotels in Copenhagen are expensive as well. The last time I visited I had a great stay at a Marriott. Having a Hyatt option, albeit an expensive one even on points, is worth consideration. I’m thinking I’d stop in to view the hotel and get a sense of this property. I’m not usually fond of staying in the middle of a city near all the tourist action. I prefer to be a short walk away, which I was at the Copenhagen Marriott. These Category 8 options are definitely splurges. For some reason, the room interiors along with the rooftop terrace and pool makes me lean towards putting this SLH property on the top of the “might enjoy” list. Alentejo is a region of southern-central and southern Portugal known as the “bread basket” of Portugal. The village of Vila Vicosa is about a two hour drive from Lisbon. While that might make it a day trip for some, this SLH might just make it a stopover for a few nights! This hotel and spa was built on a disused marble quarry thereby calling itself a marble oasis done in classic Portuguese style. The rooms have marble furnishings and carved marble pieces of artwork. What caught my eye is that none of the 44 rooms, 5 of which are suites, are alike. Differently designed rooms in a boutique hotel can make some people nervous as you never know which style room you’ll be assigned. I do think when you look at all the rooms, you’ll find, as I did, that some appeal more than others. I favored the more modern rooms, though the Arabic Suite looks wildly elaborate yet beautiful. I did some checking on cash rates and award night availability. The rates run under $200 throughout the year. During the high season I found most nights I checked available on points. At 12,000 points per night, that’s barely 2 cents a point. I love visiting Portugal and have shared many of my Portuguese impressions with you. 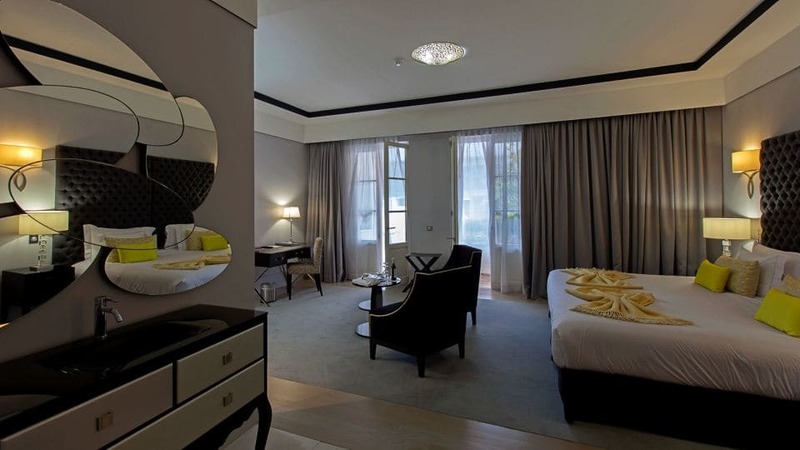 In Lisbon I favor the Sheraton Lisboa. Next time I venture to the Alentejo Region, this SLH property which now comes under the Hyatt umbrella, gets my vote. Ponte de Lima is Portugal’s oldest village. This quiet, elegant SLH property is on the outskirts of the village. Ponte de Lima is approximately a four hour drive north of Lisbon, and north of Porto. The views from this property, as well as the whole Lima River Valley area, make this area of Portugal look like a wonderful destination to explore. I feel more relaxed just looking at the hotel photos! Carmo’s Boutique Hotel has 18 rooms, including 3 suites and 3 tents. If you’ve ever treated yourself to an upscale safari trip, you’ll know that sleeping in tents can be quite luxurious. I have a feeling these tents have a long waiting list. The rooms are all unique with canopy beds and classic Portuguese decor. Some rooms have views of the Lima River Valley. I’d enjoy one of those! I did some checking on cash rates and award night availability. The rates run from the $200 to the low $300’s depending on season. Even during the high season I found most nights I checked available on points. At 25,000 points per night, that’s not even 2 cents a point. I’m not sure why, given the cash rates, Hyatt gave this property a high category rating. It does look like a property I’d enjoy because I’d get Hyatt points for my stay and perhaps Hyatt benefits to match my Globalist status. However, I wouldn’t use points for my nights. Outdoor restaurant enjoys a lovely setting! This Hyatt partnership provides more choices for anyone looking to earn or redeem World of Hyatt points. You can earn World of Hyatt points with the World of Hyatt Credit Card. Currently the card is offering a welcome bonus of 25,000 World of Hyatt bonus points after spending $3,000 within the first three months. You’ll earn another 25,000 bonus points after spending a total of $6,000 within the first six months. World of Hyatt is also transfer partners with Chase Ultimate Rewards, so you can transfer over points earned on cards like the Chase Sapphire Preferred Card, Chase Sapphire Reserve Card, and Ink Business Preferred Credit Card. Now that the integration of these new Small Luxury Hotel properties has continued, I’m looking ahead and find that some on the list of properties being added to the Hyatt portfolio merit my attention. It will be interesting to watch this unfold and see how benefits will be honored. The award charts for some of these unique properties seem a bit off in the cash to points value. However, that’s for each of us to decide given how we value our Hyatt points. For me, one point of major excitement in this partnership is that even though Hyatt is rapidly expanding in Asia, these offerings expand Hyatt’s presence in Europe. Thank you, World of Hyatt, for bringing the best Small Luxury Hotels into the program. Showing Europe more love makes me happy! Do any of the properties Hyatt is bringing on board through this SLH partnership pique your interest? Are there any you’ve already stayed at that you’d recommend? Do you know what benefits do Globalists get with these hotels? Good question, Michael. I agree, a bit more clarification would be helpful. I’ve reached out to Hyatt and will let you know the answer as soon as I hear back. Stay tuned! HI Michael, Here’s the clarification from Hyatt: “The exclusive on-property member benefits at participating SLH hotels apply to all World of Hyatt members staying on an Eligible SLH Night, irrespective of their elite World of Hyatt membership tier status. The differentiating perk for elite status levels is the standard tier Bonus Points on eligible room revenue spend (10% Discoverist, 20% Explorist, 30% Globalist).” Hope this info is helpful, and thanks so much for reading!